Yes, I said dry goods. 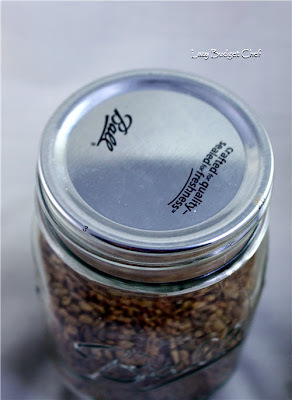 You can vacuum seal grains, spices, coffee, and such in mason and recycled glass jars you might already have at home. 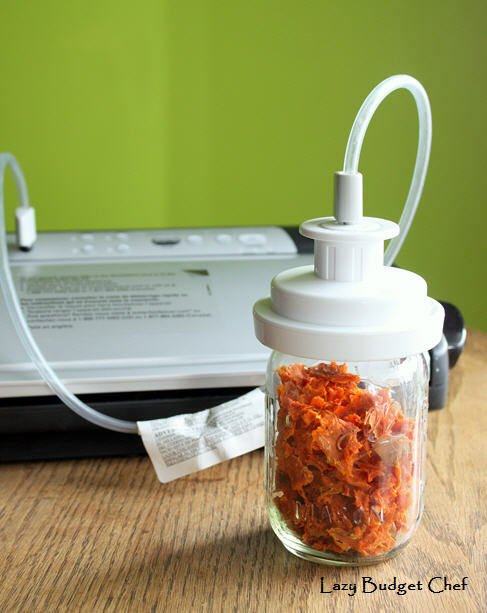 I particularly like to vacuum seal the garden vegetables and herbs I dry in my dehydrator (this is the exact dehydrator I have and I love it!) to keep the flavor from expiring until I remember I have them in the back of my cupboard. Yes, I tried sucking the air out of the bag with a straw. It didn't work. Mason jars are easy to vacuum seal but you will need to buy a Foodsaver wide mouth or regular mouth mason jar attachment here. 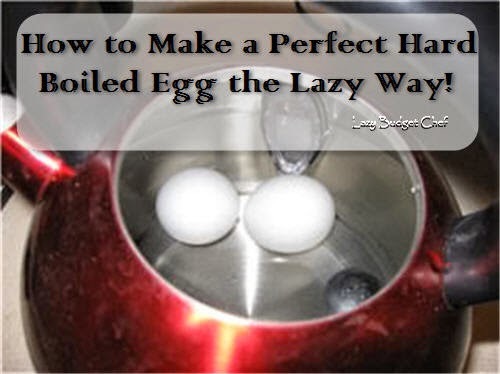 You will also need a mason jar and metal lid. You don’t need a mason jar canning ring but I usually screw it onto my jars after I seal them to hold a paper jar label in place. Without jar labels I would be lost. 1. Put the food item in the mason jar. You may want to cover find powders and grains with a clean coffee filter or piece of paper towel to keep the vacuum hose from clogging. 2. Put the metal lid on the jar without the metal canning ring. 3. 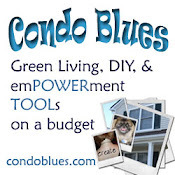 Attach the mason jar attachment to the hose on your Foodsaver. 4. Put the jar sealer firmly over the top of the mason jar. 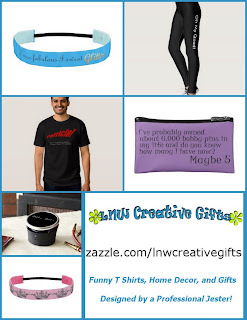 Pin this post to your Pinterest boards for later and to share it with your friends! 5. Press the locking lever on the side of the Foodsaver. 6. Press the Canister button on the Foodsaver. 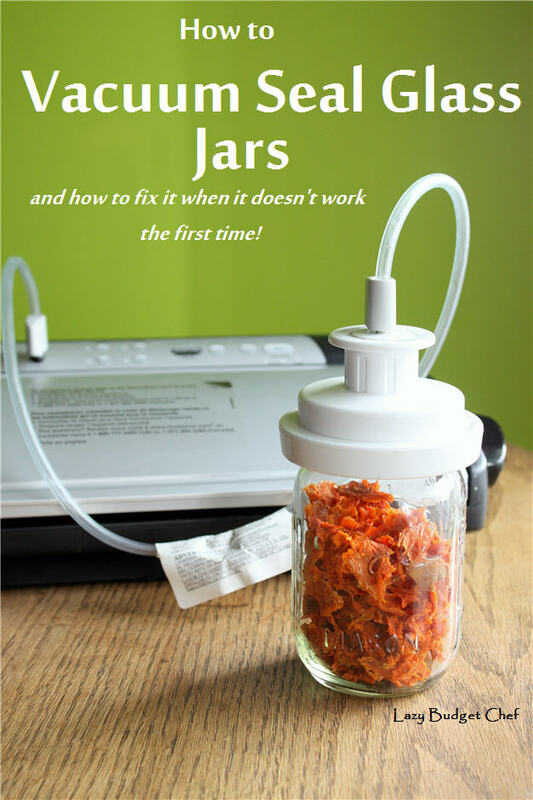 It will automatically shut off when the jar is completely sealed. 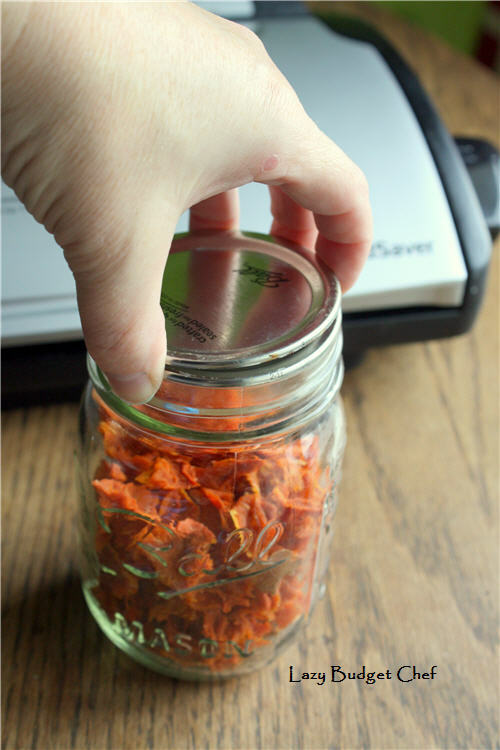 Why Didn’t My Mason Jar Vacuum Seal in my Foodsaver? 1. 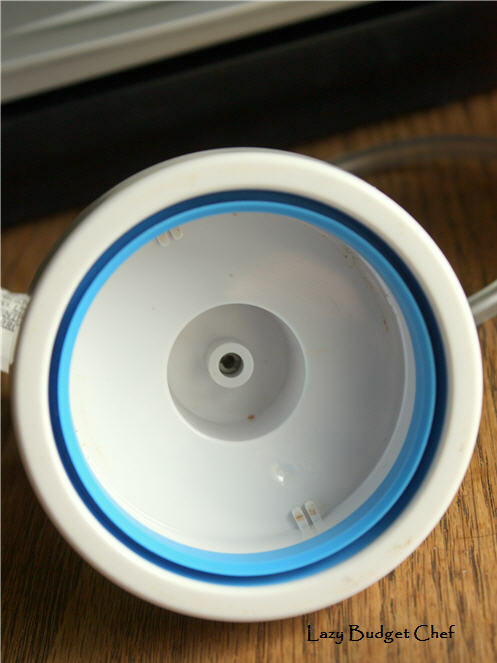 Check to see if the rubber gasket inside the jar sealer attachment is flat or bend. Remove the gasket, fluff it wit your fingers and try again. 2. You may have too much empty space inside your glass jar. Either pour the contents into a smaller mason jar or you can add a clean paper towel to the jar to fill the large head space. 3. Check to see if the lid is correctly lined up on the top of the jar. 4. There might be a small bend in the metal jar lid. Put a second metal canning lid on top of the first canning lid and try vacuuming sealing the jar again. 5. The jar sealer attachment may not be firmly seated on the jar before you tried vacuum sealing. You can also vacuum seal your own empty glass jars for food storage as long as you have the original undamaged lid for the repurposed jar and one Foodsaver canister like this one. 1. Put your food items in the empty glass jar and screw the metal lid onto the jar. 2. 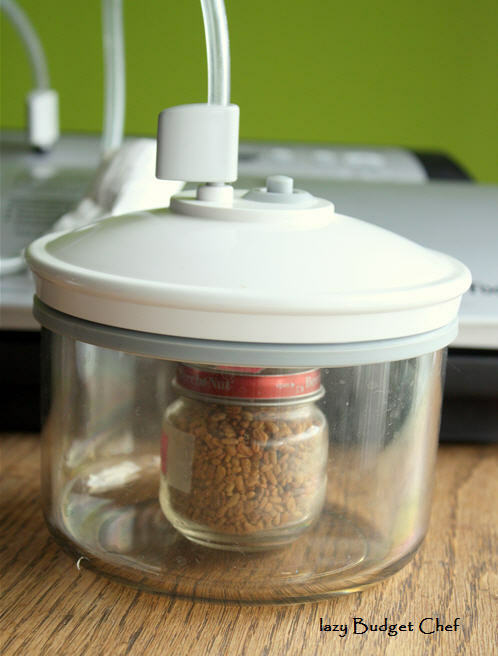 Put the glass jar inside the appropriate size Food Saver vacuum consider and attach the lid. 3. Attach the vacuum sealer hose to the canister and Foodsaver port. 4. Press the locking lever on the side of the Foodsaver. 5. Press the Canister button on the Foodsaver. It will automatically shut off when the jar seals with a pop! 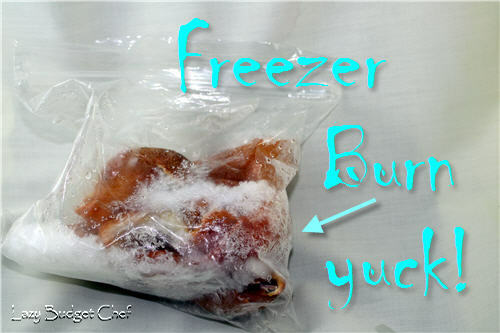 If you want more low waste vacuum sealing and food storage ideas check out the options - and more! - below!